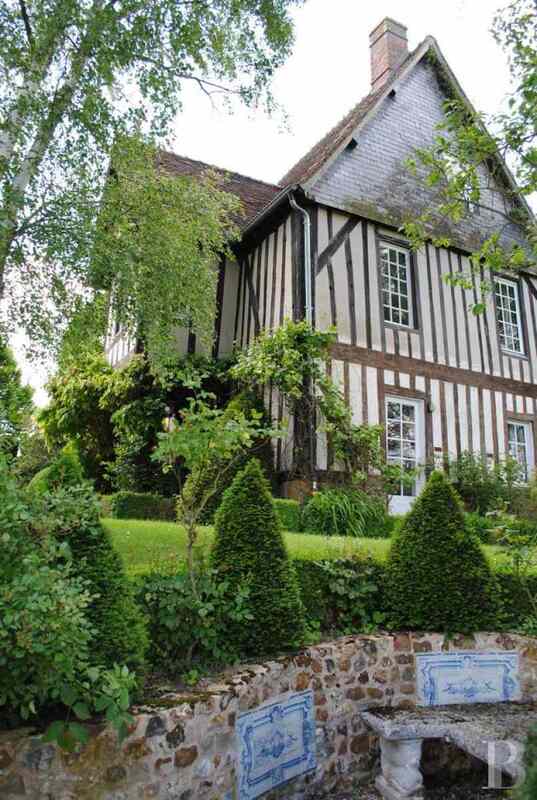 A 16th century Seigneurial manor house in a Normandy Valley in the Auge region - France mansions for sale - in Normandie, Bretagne, North, Perche - Patrice Besse Castles and Mansions of France is a Paris based real-estate agency specialised in the sale of Manors. 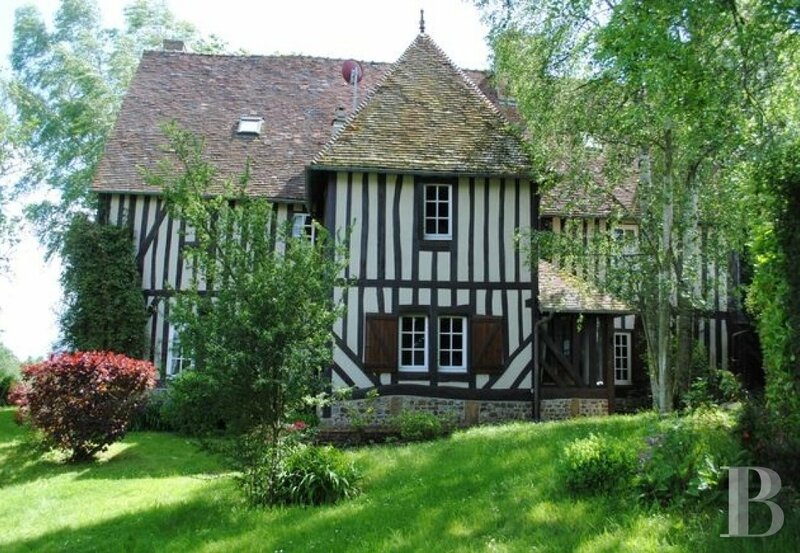 150 km from Paris, in a valley that borders the French departments of Eure, Calvados and Orne. 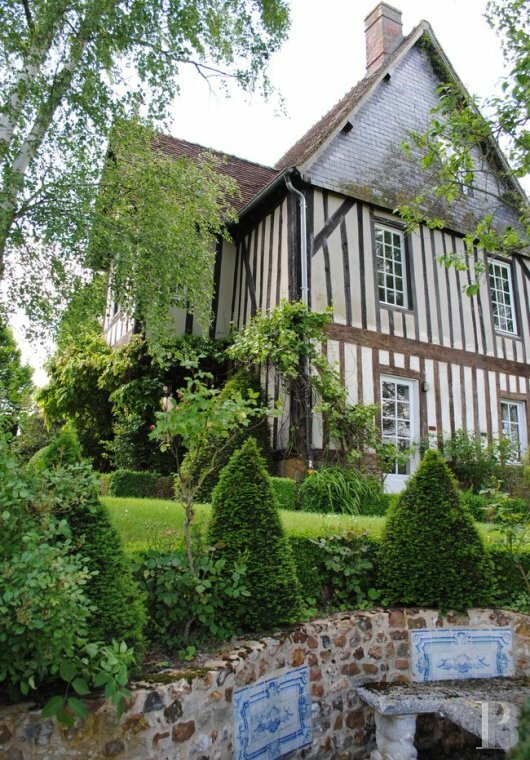 The subprefecture of Bernay with its French SNCF train station is 20 minutes away. All local shops are 4 km away. 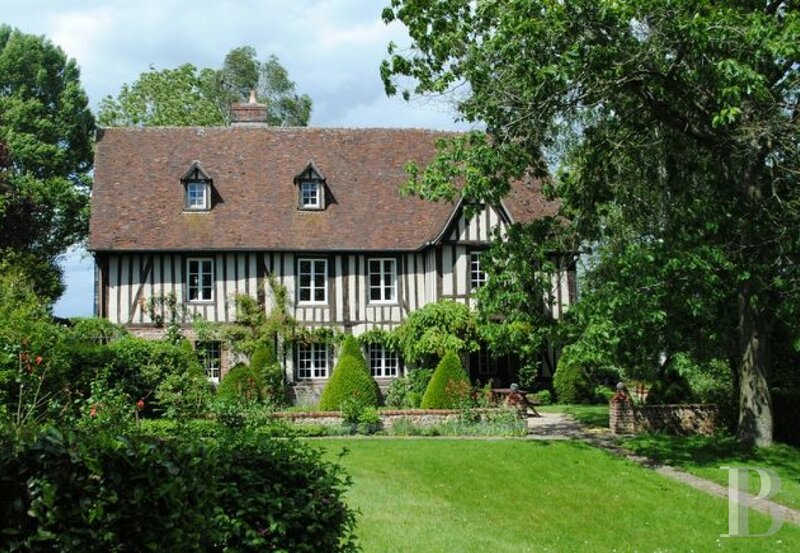 Access to the A28 motorway is 10 minutes away. 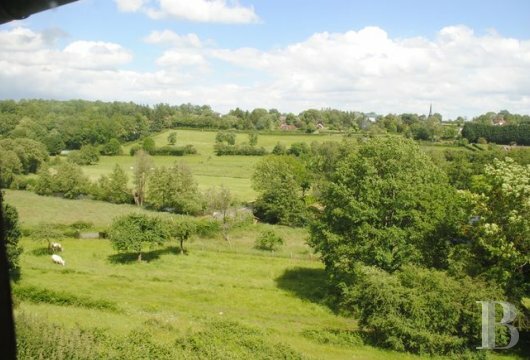 Situated above the north bank of the Charentonne, along a country lane that winds its way through meadows. Entrance gates open on to 2,000 m² of land. 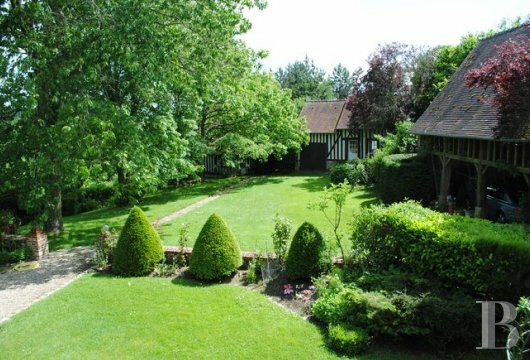 On the left is a manor house, opposite which is a guest house and a building currently used as a study and a garage. The grounds are planted with trees and flower beds; a low stone wall delimits a terrace and a paved alleyway leads to the entrance. On a lower level is a meadow running alongside the river. The view over the surrounding countryside is omnipresent throughout the property. Its name comes from the fact that in the 18th century a “planche” (plank), an old French word for a bridge, made it possible to cross the river “à pied sec” (with dry feet) and therefore to collect a tax. 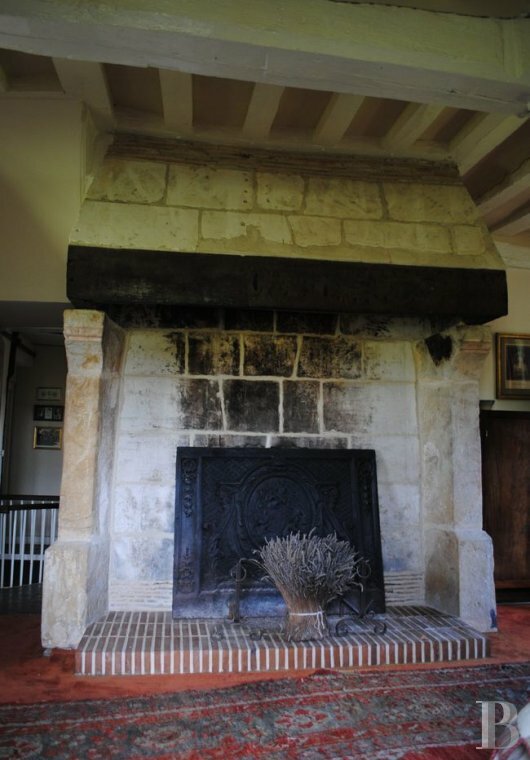 A plaque in one of the fireplaces indicates its construction date: 1583. 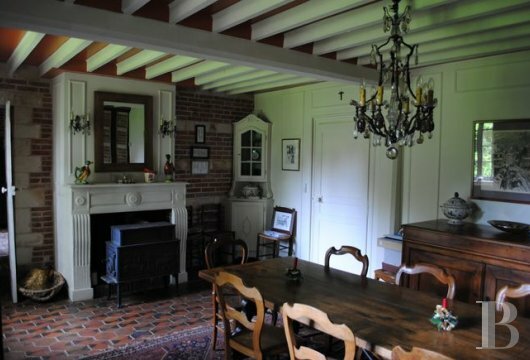 Built on lower sections of flint and brick, the upper sections feature half-timbering. 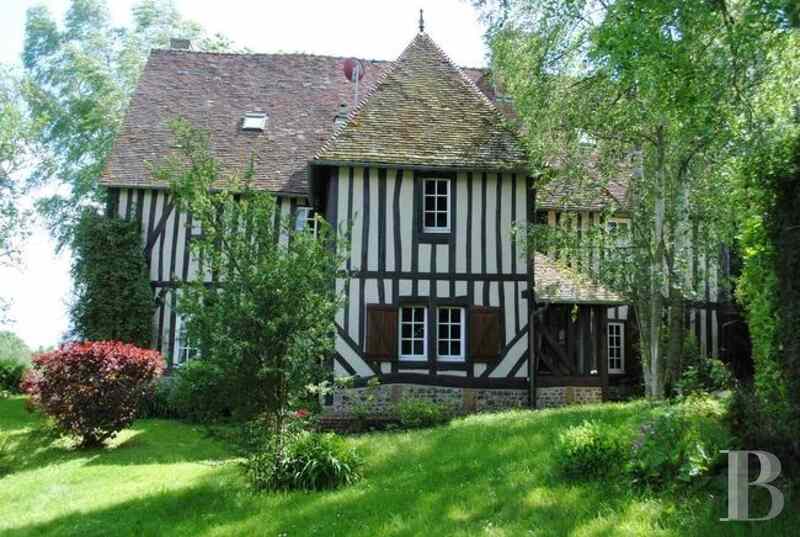 The Pays d’Auge being the only region where wooden constructions were given a noble appearance. Never having had to play a defensive role, its windows are sufficiently large as to let in copious amounts of light. The gable roof is covered with flat local tiles. 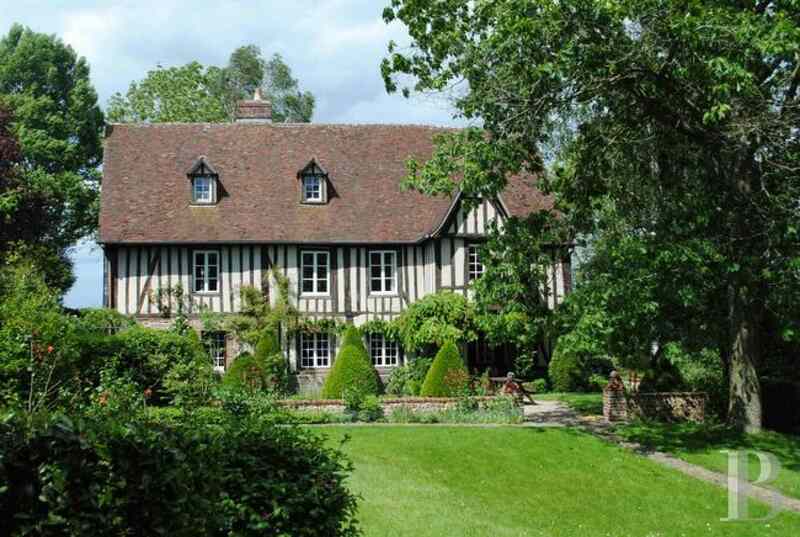 Slightly offset and projecting vertically on the front facade, a square extension supported on wooden pillars that span the full height of the ground floor, has a gable roof enhanced by a finial. The roof has two small roof dormers that are in line with the windows on the lower levels. The rear facade features a projection that contains the kitchen. 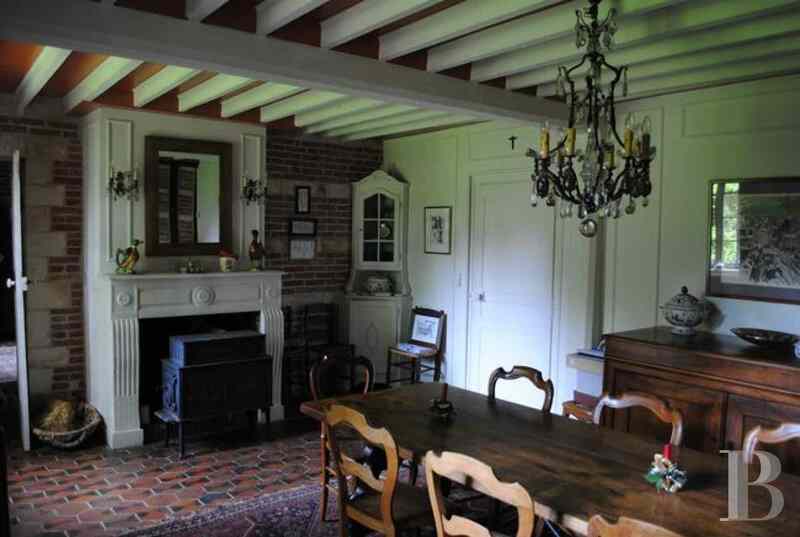 This manor house spans a floor surface area of approx. 220 m². A lounge with a monumental fireplace, brick walls, stone window framing and terracotta floor tiles, acts as an entrance hall. This extends into a dining room with a fireplace that opens into another lounge with a fireplace featuring terracotta tiles and parquet flooring. A fully fitted kitchen and a pantry with a toilet and a boiler room complete the ground floor. A two quarter turn stairway leads to a landing. 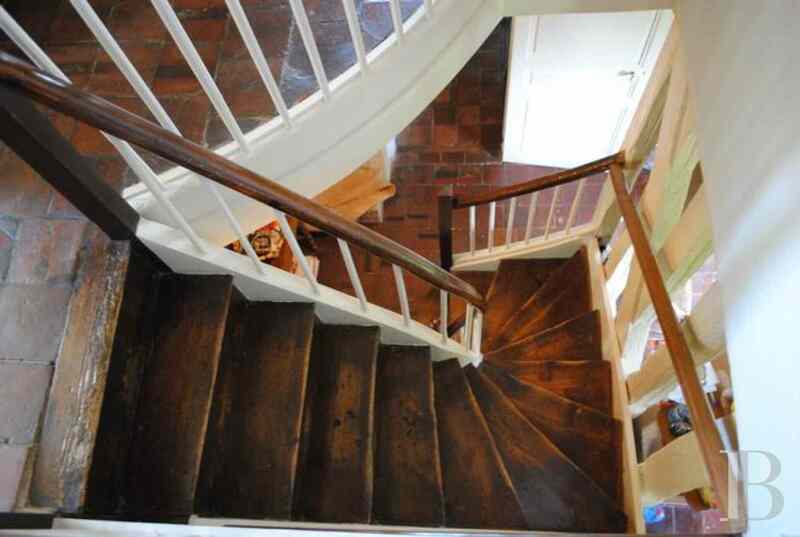 To the right is a large bedroom with a fireplace and a stairway leading up to an attic that could be converted. Opposite, a room that could be a dressing room opens into a large bedroom with a study, and a bathroom and toilet. To the left is a bedroom, followed by a bathroom and toilet. A landing leads to a bedroom and a large attic that could be converted. 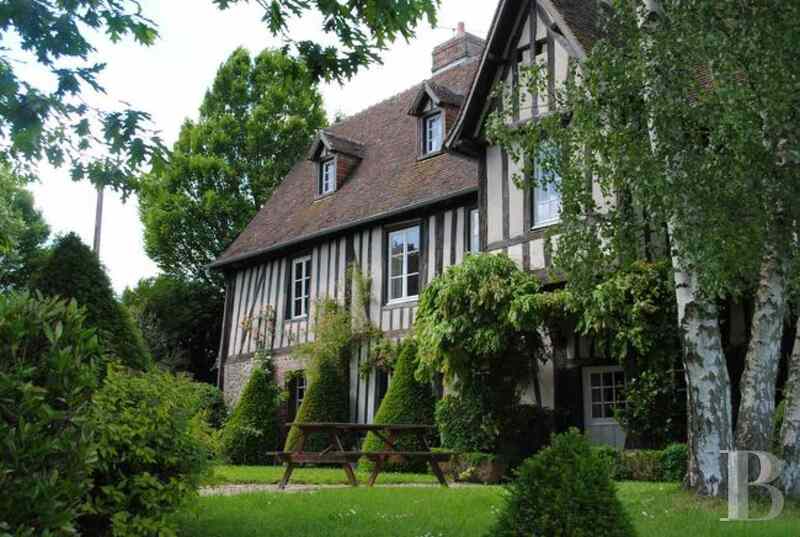 A half-timbered guest house with flat roof tiles, comprising a kitchen with an eating area, a lounge with a fireplace and a superb view over the valley. A mezzanine floor includes a bedroom with a bathroom and toilet. A garage that extends into an office, with a room that could be used as a bedroom on a mezzanine floor. A very private setting for this residence with its reasonably sized living rooms and garden. 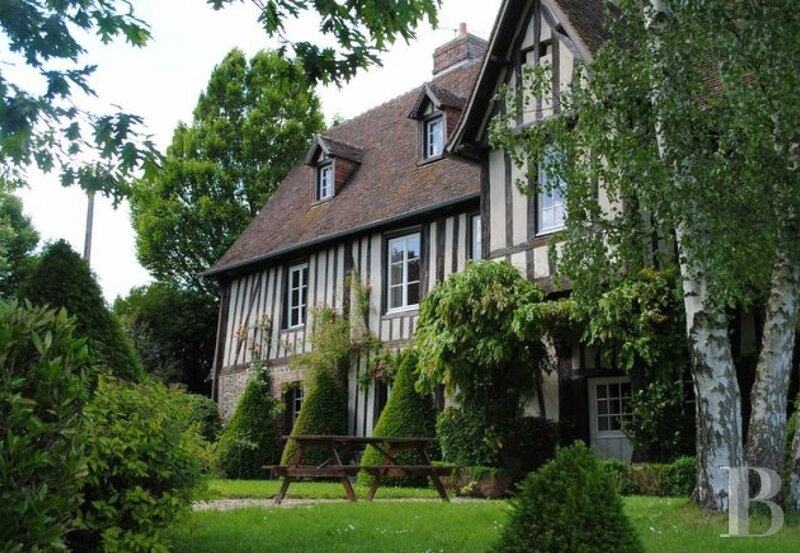 With a most pleasant, relaxing view over the Normandy countryside, the manor house and its outbuildings are in a very good state of repair and have been immaculately kept by their various owners. 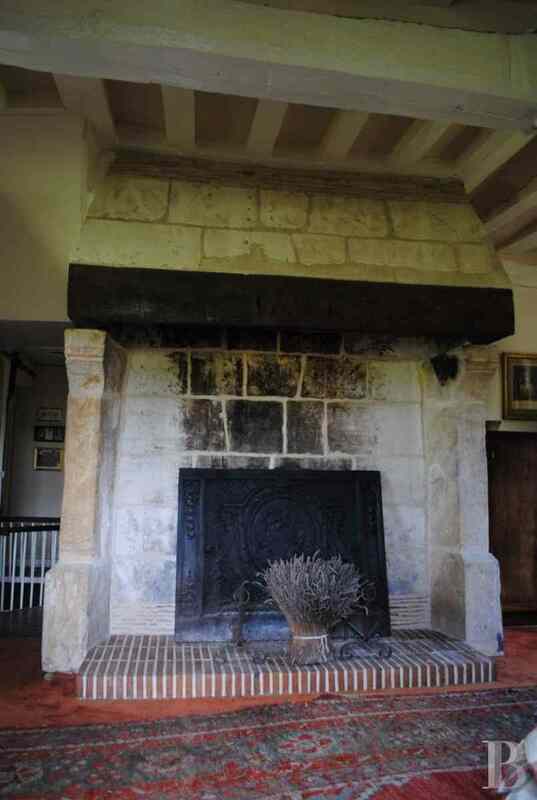 It is a site with a wealth of old and contemporary history.